» Featured, Bump To Top, Renew and Free Ads. Featured, Bump To Top, Renew and Free Ads. Premium, Bump To Top, Renew and Free Ads - How do they work? 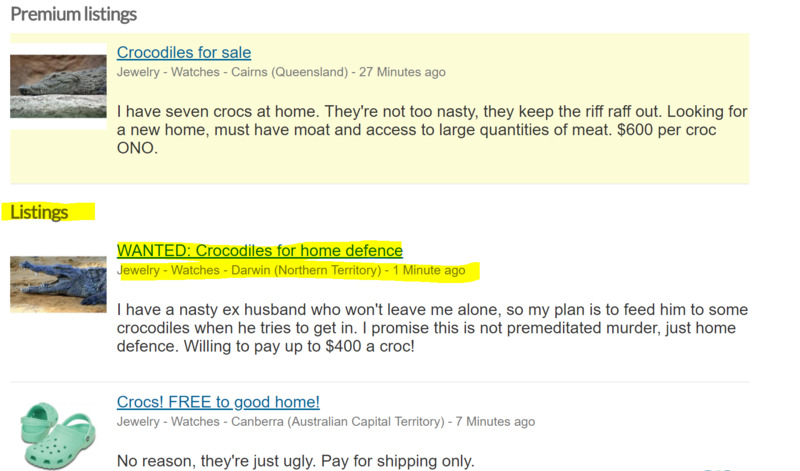 A Premium ad is an ad that is shown at the top of the category page, highlighted in yellow. It is an ad enhancement. There are 3-4 of these at the top of each page and at intermitent points throughout the listings. They change positions at various points and rotate so each one gets fair coverage. 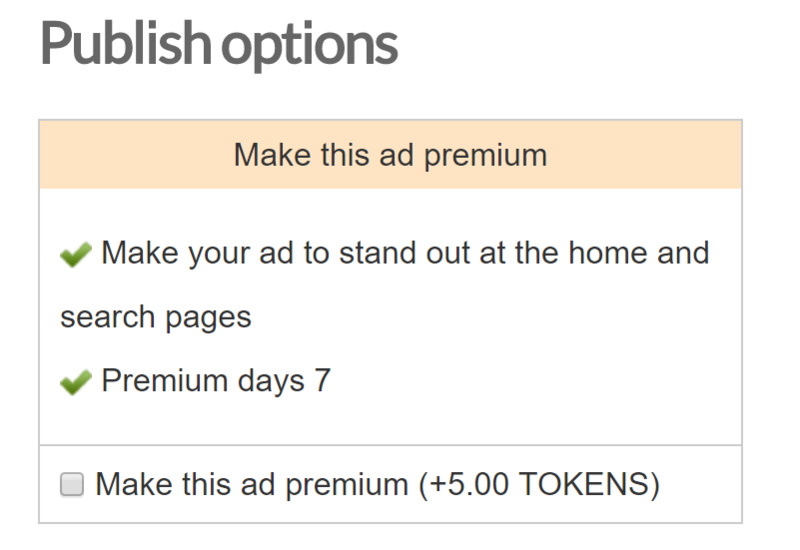 Each Premium ad costs five tokens, and is active for seven days. Bumping your ad to the top means the convenience and ability of having a button that you can click that automatically moves your existing ad to the top of the bumped/free ads and below the top featured ads. It won't stay at the top like Premium ads do, and it will be pushed down as new listings are posted - both bumped listings and free listings, but this will take your ad from the page it was on (presumably not the first) to the front page of that category, which increases the chances that buyers will see it. 1. Make sure you are logged in and you have purchased tokens to pay for the Premium status. You can learn how to do that here! 2. Post an ad, or select an ad that has already been published. 5. Now you simply pay with your credits to make the ad Premium! My Premium ad isn't visible right now, have I done something wrong? Probably not! There are four slots at the top of each category for Premium ads. The ads rotate through every time a page is refreshed or the next page is selected, if there are more than four ads that are premium in that category. To test this, you can refresh the page until yours comes up! The system tracks which have been shown so each gets an equal number of viewings. 1. Once again, make sure you're logged in! Select "My Account" at the top right of the homepage. 2. Scroll down until you see the ad that you would like to bump to the top, click on it. 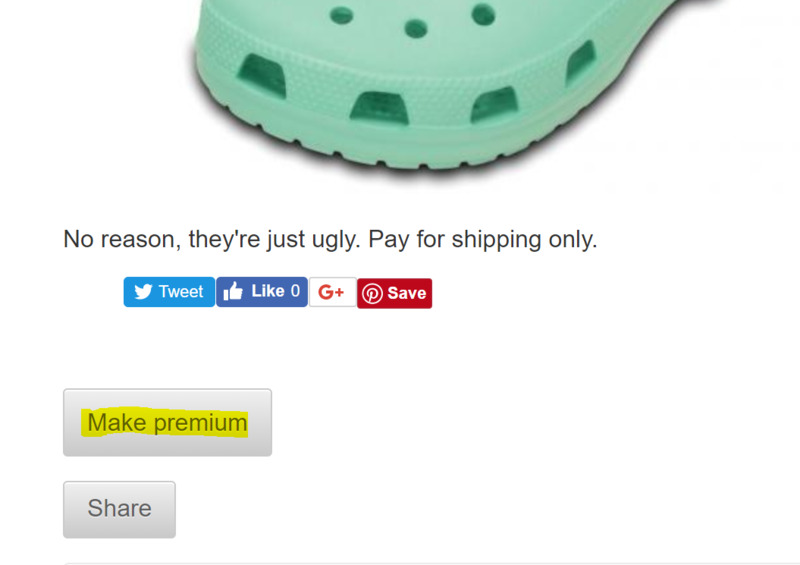 Don't click on edit, just click the listing itself. 4. Select "Move to top" and activate special features, bumps and renewals with your credits! If you have any further questions, please don't hesitate to contact us! 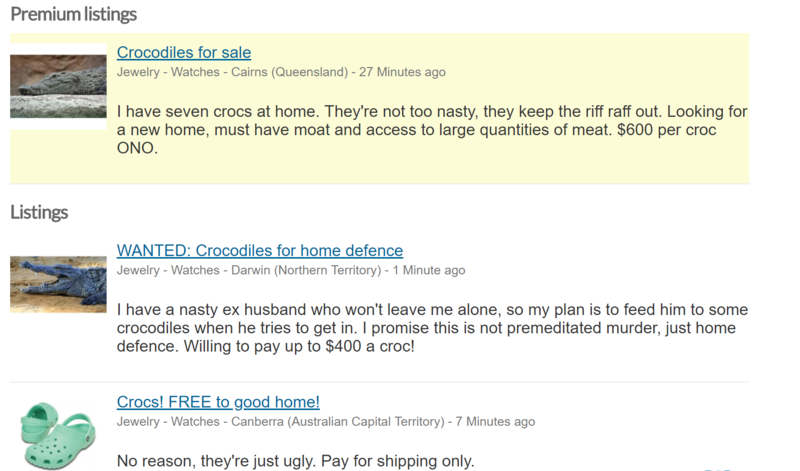 @CrockorLive or @CrockorAds on Twitter.